With the departure of “Breaking Bad” and the impending finale to “Mad Men,” AMC needs another quality, cornerstone program to boast come future awards seasons as well as in their future advertising campaigns. While “The Walking Dead” seems the obvious heir-apparent investment with its broad fan base and a spin-off on the way, many have grown tired of the program’s repetitive concept of post-apocalyptic zombie hunters/ survivors travelling. The show’s appeal became even further diminished as television programs on every other network developed zombie- or apocalypse-base programming—often combining the two. 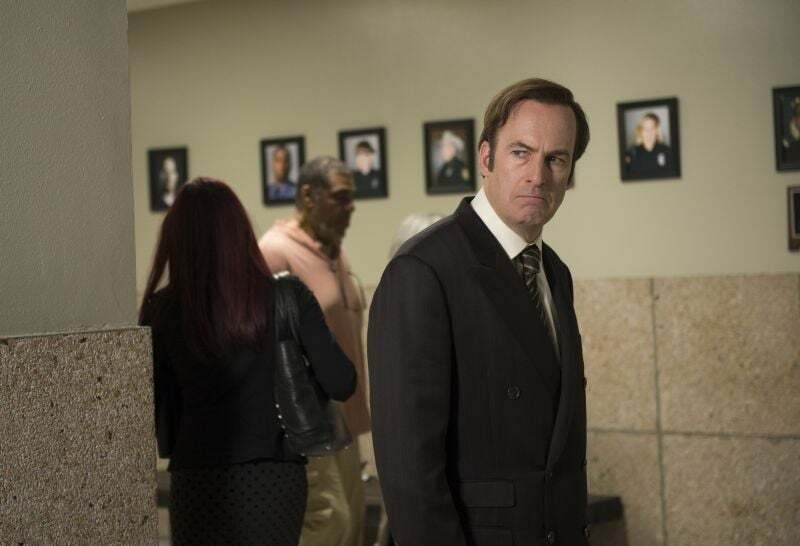 Enter “Better Call Saul,” a spin-off of “Breaking Bad” that features a secondary character from the program. The show doesn’t copy the concept of its origin, but expands on the motivations, psychology, and history of an interesting character with a different situation than Walter White, “Breaking Bad’s” protagonist. 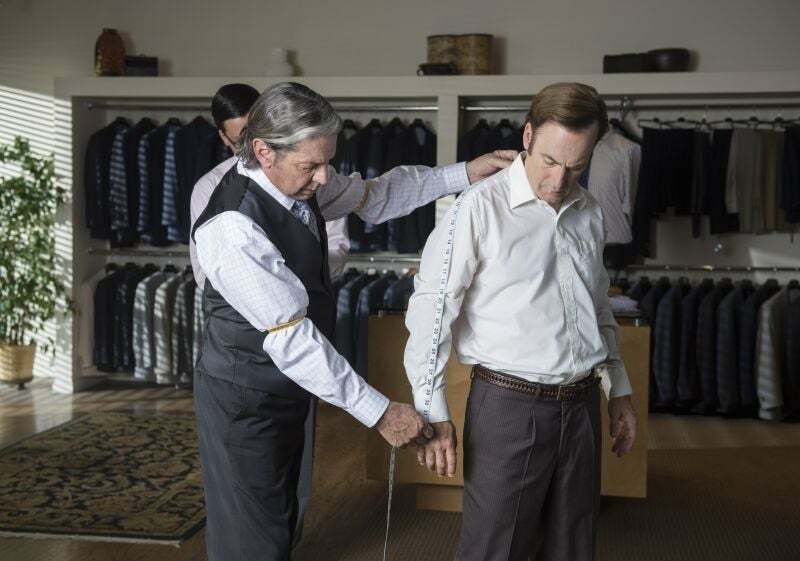 This week’s episode of “Better Call Saul” particularlycreated a deeper back-story for Saul/ Jimmy McGill that should further separate his motivations and psychology from that of Walter White. Director Colin Bucksey (“Fargo,” Dealers) begins “Hero” some years ago in Chicago as a younger Jimmy McGill and a pal drunkenly roam the empty streets in the wee hours. As they make their path down a dark alley, Jimmy’s pal notices a fat wallet with at least $1,000 in it and decides immediately to keep it. As the pal examines the wallet further, Jimmy notices a man lying behind a dumpster—the wallet’s true owner as proven by his license inside of it. The man comes to, but appears to be on a seriously ugly drug trip. Jimmy decides that he really doesn’t want the wallet anyway and decides to lift the drugged man’s watch—deducing the value to be greater than the wallet’s contents. His pal doesn’t want to make out with less wealth than Jimmy, so he trades the wallet and the additional cash he had in his own wallet in exchange for the watch. His pal bolts with the watch before Jimmy can go back on the deal and retain it; however, the unconscious man reveals himself as fully lucid, and subsequently a participant in a scam with “Slippin’ Jimmy” for the pal’s money. The watch had no value. The sequence ends with Jimmy and his friend celebrating with drug use. The scene showed just how dissimilar Walter White was from Saul Goodman by demonstrating a past of perpetual despicable behavior on Jimmy’s side of things. Walt was a respectable man until drug cooking and subsequent megalomania set in—Jimmy’s just a flimflammer with a big mouth and no dignity. Kudos to the creators for establishing a solid history for Saul that subsequently equates to the beloved BrBa character. The camera then jumps to the moment of cliffhanger from “Nacho.” Saul and the Kettlemans deliberate just outside the tent. They offer to bribe him, but the lawyer refuses and instead offers to legally represent them over his brother’s firm. Mrs. Kettleman then insists on the bribe, presenting Jimmy with the money. They tell him that he’s the kind of lawyer whom guilty people hire and indicate that they have no intention of changing counsel. As Jimmy drives into the courthouse the next morning, he asks Mike Ehrmantraut if he saw the daily newspaper and then thanks the parking attendant for his sage advice which ultimately helped him find the Kettlemans. Inside the courthouse, law enforcement releases Nacho as a suspect in the Kettleman family disappearance. They get a moment together where Nacho correctly accuses Jimmy of tipping the family off to his intentions which led to this media circus. The attorney counters that “whoever” tipped the family off did Nacho a huge favor as the police already had probable cause, motive, and his documented presence in the neighborhood the night of the disappearance. Nacho doesn’t appear as if he wants to agree with his counsel as the scene ends. Much later in the evening, after the salon empties for the day, Jimmy takes a fat stack of cash out of his drawer. He took the Kettleman’s bribe and decides to pay of his debts/ fees. With the remaining money, he invests in an endeavor to spite HHM by copying their billboard advertisement in nearly every possible facet. He begins his plan the next morning by humorously visiting a haberdasher and dressing himself in Howard Hamlin’s exact specifications by reading them off of a prepared list. After speaking with Hamlin, Kim visits Jimmy that evening to confront him about it as he enjoys a glass of cucumber water and a footbath in the dark salon. Hamlin then takes Jimmy to court where the judge decides Jimmy has, in fact, legally infringed on HHM and is given 48 hours to take it down. Perhaps the best moment in this scene occurs when Howard Hamlin calls attention to the fact that he and Jimmy wear the exact same suit. Walter White could be vengeful, but not on the petty angles that Jimmy explores. Jimmy escalates his revenge by calling every media outlet phone number he can think of with the angle that he’s a small business getting bullied and diminished by big business with the aid of the government. Nobody takes interest, however a chance glimpse of a UNM sweatshirt causes the down-on-his-luck counselor to call the university’s media department for student assistance. The student camera man and boom operator meet Jimmy to tape the lawyer’s sympathetic plea to keep his advertisement as a man removes the billboard in the background. As they film a take, the man working on the billboard slips and falls from the high platform and is only supported by his swinging harness. McGill quickly jumps to action and climbs all the necessary ladders in order to rescue the swinging man who is discreetly revealed to be an actor in another scheme by Slippin’ Jimmy. While the scam doesn’t directly net him any cash, the publicity stunt alone causes a spike in cases for Jimmy the next day as media coverage really takes wind of the story. Kim and Howard catch the story on the news and know Jimmy’s scam, but it’s too late for them because the damage already happened and they have no proof. Howard spent a lot of time getting toyed with by Jimmy this week and still refused to recognize the potential, formidable opponent in the loud-mouthed Chicago lawyer.